Here’s a link to a fine comment which was published on the Scottish Football Monitor* discussion forum this week. Humble Pie’s post is a first class piece that highlights the cognitive dissonance in every department of our society. The key recognition is that the bodies who take charge of almost every field – medicine, law, education, government, nutrition, banking, sport and many others – do the most damage to the supposed ends of these institutions. They are an enemy within, exactly the opposite of what it says on the tin. That is the context in which we must look at the running of the SFA and the major bodies which are affiliated to it. It is not through accident or incompetence. Even when the general public is angry enough to mobilise itself into activism to demand change, the people in charge do not respond to the core demands for integrity and honour, Instead, they concentrate their efforts on finding a way to carry on running their shop as before but with a slightly different window display. I blogged earlier this week about how the American people brought about the fall of Richard Nixon only to see his appointed successor, Gerald Ford, abuse his executive authority to thwart the ends of justice by unilaterally pardoning Nixon. There are countless similar examples such as bankers who should be jailed for fraud being given obscene bonuses for bankrupting entire nations. I have no doubt that there are many people at the SFA who will not hesitate to do something similar with Rangers if they get half a chance. They have numerous allies in the SPL and SFL who will do their bit as well if they can. That is why HP’s superb post should be circulated far and wide. The people running the game have done absolutely nothing to suggest for a moment that they can be trusted to do the right thing in this scandal. It is vital that they are not only kept under the closest scrutiny but also that the scrutiny is illuminated by the clear understanding of the dynamics at play. In that regard, Humble Pie’s post is as good a source of illumination as any. Please read it and share it as widely as possible. The first thing we learn about playing football is that you have to keep your eye on the ball. We have since learned that that applies equally to football administration and governance. * The moderators of the Scottish Football Monitor have a tendency to delete posts which are not in tune with their site’s goals. This has an unfortunate consequence of rendering links to subsequent posts invalid. In case such a fate befalls Humble Pie’s post, I shall reproduce the full text of his comment here as a back up. As we await the outcome of the Lord Nimmo Smith enquiry into breaches of SFA regulations on players registration by Rangers FC PLC (since renamed and placed into liquidation), I thought it worth taking time to consider the context in which this failure of governance has played out, or the ‘bigger picture’ if you will. I don’t know about you but any childhood illusions that I may have had that ‘the authorities’ were there to ‘look after us’ has been well and truly shattered over the last two decades or more. In recent years almost all of our ‘most trusted’ institutions have been shown to wear no more than a wafer thin veneer of honesty and integrity. Break through that slim membrane of deceit and we are faced with the startling reality that self-serving corporate corruption is now absolutely endemic in our society. The corporatisation of our civic life in particular has been imperceptibly slow and deliberate. While our little heads were filled with dreams of ‘change for the better’ with each new dawn and each new government, behind the scenes, men who care only for personal profit have been allowed to usurp our most coveted ideas of peace, justice, education, health, wealth and ultimately happiness. Almost all of the once venerated institutions that we entrusted with guardianship over our ‘public services’ have now been found to be morally bankrupt. Successive governments have lied the people into wars of conquest, taking hundreds of thousands of innocent souls while our citizens slept on the streets and elected ministers claimed for second homes and £60 light bulbs. The big banks gambled with our hard-earned money and lost the lot, then the government borrowed the same amount from the same banks (created out of thin air) and gave it back to them to gamble with some more. The mainstream media continually distorts our view of the world and its people, distracts us with flashy advertising, sensationalist flannel, celebrity gossip and naked breasts, while fermenting discord and division among the citizenry and intruding on the lives of the innocent victims of crime. The TV broadcasters have covered up the most heinous abuses against children perpetrated by their own staff, while we were busy being ‘programmed’ to become disengaged, disinterested and opinionated voyeurs of so called ‘reality shows’. Hospitals now care more about bed space and cost benefit analyses than looking after the sick and the elderly, our nurses are overworked and undervalued while many doctors have become hopelessly corrupted by financial kickbacks from the pharmaceutical industry. Education has again become more of a privilege than a right with the increased cost of hidden fees, accommodation, transport and the lack of any real, meaningful edification and purpose for our young people. Most of the good teachers have left what used to be a ‘vocation’, many of the rest are bored, disempowered and underpaid for the role with which we entrust them (developing the skills of our children). The Police which used to provide the public with a ‘service’ has now become a ‘force’. No longer do we have policemen and policewomen, now we have ‘officers’. Each individual police force is now an separate corporate entity (look it up on Companies House) their officers obliged to generate income by issuing ever more fines and charges to balance their dwindling budgets. So the question is, why should I expect football be any different? Football is governed by a set of rules or customs, which serve to ensure fair competition, and allow consistent adjudication of the winner. These rules are encompassed by the principles of respect, fair play and sportsmanship and are agreed to by all participants….or so Sepp Blatter would have us believe. During the last couple of years, particularly throughout the Rangers saga, I have become more and more disillusioned by the lack of morality and integrity that has been displayed by the Scottish football authorities. They have ignored their own rules when it suited them and applied them with full ferocity when it suited them. At times their obfuscation and outright hypocrisy has been breathtaking. Compare and contrast the SFA’s treatment of Spartans for accidently failing to put a date on a form twice, and the former Rangers, who deliberately withheld information from the SFA, failed to pay millions of pounds to their civic taxes nor their many creditors (football related and otherwise) and have brought the entire game into disrepute in this country on more than one occasion. How can they possibly get away with it? I hear you ask. That the SFA, the president of which is ‘heavily conflicted’ in the entire shenanigans, has fobbed this enquiry off to the SPL (who have no real jurisdiction over the breaking of SFA rules) who in turn fobbed it off the retired Lord Nimmo Smith’s ‘independent panel’ tell us what exactly? That they want justice to be done and to be seen to be done? Perhaps. However, that the same SFA still fails to state categorically the status of the club called The Rangers currently plying their wares in SFL3, even though the answer to this simple question remains fundamental to the integrity of the sport and any hope of reconciliation among the now deeply divided supporters, doesn’t fill me with confidence in their governance of the game. What do I expect to happen? Well my experience has taught me to expect the worst and to hope for the best. No doubt, whatever the outcome of this enquiry, that will not be the end of it. In my humble opinion, ‘interested parties’ will seek to make this a long drawn out affair (ain’t it always been so) with judgements and appeals, claim and counterclaim, appeals to the SPL, SFA, CoS, CAS, UEFA perhaps even finally ending up on Sepp Blatter’s Louis XIV style oak desk in Zurich. Where we can expect………………………..? Will we have to add ‘and the SFA destroyed Scottish football’? I hope not but I am beginning to expect so. 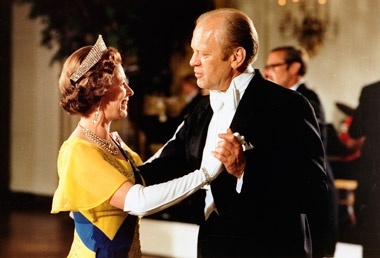 Thirty-nine years ago time was running out for the thirty-seventh President of the United States of America. The perception was growing that Richard Nixon was in serious danger of being impeached and might even be removed from office before his presidency had run its course. Investigations into his part in the cover-up of the Watergate scandal were exposing the corruption that riddled his administration and as more and more damaging revelations continued to unfold, an unimaginable scenario was gradually turning into an inevitable reality. It was becoming increasingly apparent that Auld Nick really was likely to get nailed, discredited and disgraced. The processes were gathering momentum, legal procedures were in motion, political resolve to remove him was strengthening and media which had previously supported him could no longer ignore the reality and scale of the crisis. Pro-Nixon apologists warned of dire consequences which the nation would inevitably suffer if it dared to bring the President to justice but they were misjudging the mood of a nation that had become increasingly sickened by what it was discovering about its government. The American people were not scared of facing up to the crisis, however unpleasant it was going to prove. They were determined to dig down all the way to the root of the problem in order to hold the guilty parties to account and also to send a clear, unequivocal message to future executives that a cynical betrayal of the standards expected of them would not be acceptable. Nixon helpfully tried to reassure everyone and addressed the nation with a denial of any wrongdoing, introducing a legendary soundbite which spectacularly backfired. 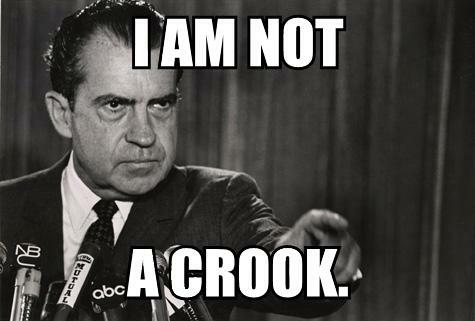 Overnight, “I am not a crook,” became a national joke which appeared on tee-shirts, coffee mugs, posters and bumper-stickers. By that time he was already sacrificing numerous key political allies, many of whom subsequently went to prison, and it was no longer preposterous to consider that Tricky Dicky himself might be sent down once he’d been brought down. Finally, less than two years after winning re-election to the White House in one of the biggest landslides in American history, with impeachment now looming large on the horizon, Richard Milhous Nixon recognised that he no longer had sufficient political support in Congress to enable him to carry on effectively. He resigned and handed over the presidency to Vice-President Gerald Ford, who was sworn in within twenty-four hours. Although his resignation released him from the threat of impeachment, Nixon was now liable to face criminal charges from which he’d been immune while serving as the President. Campbell Ogilvie stonewalls as the wife of a fellow Freemason tries in vain to jog his memory about a long-standing, unpaid debt. Between 1974 and 1976, the government of the United States of America — the self-styled leader of the Free World and the greatest democracy in the history of the universe — was led by a head of state who was never elected to any office at the White House. He had become the Veep when the career of his predecessor, Spiro Agnew, crashed and burned in yet another scandal. Up to his ears in charges of fraud, bribery and tax evasion, Agnew cut a deal in which he resigned from the vice-presidency and pleaded No Contest to the charges in return for which he got to not go to jail. Nixon had a good feeling that Ford was the type of chap who might be able to bail him out if the worst came to the worst. Something of a Great Administrator who would never allow any matters of principle or integrity to stand in the way of his own personal advancement, Ford had served reliably and with complete discretion on the Warren Commission cover-up of the John F Kennedy hit. He had proven himself to be a man who could be depended upon to haul himself up the greasy pole by steadfastly not seeing the crime of the century even when it was presented to him in detail over the course of an entire year while he sat with one of its architects. SFA President Campbell Ogilvie ensuring that Rangers player registrations comply with SPL rules. It should scarcely have been a surprise then when, within a month of becoming the unelected President of the U.S.A., Gerald Ford presented the man who gave him his job with a Get Out Of Jail Free card in the form of a “full, free and absolute pardon.” This instantly removed any possibility of Nixon being indicted for any criminal actions he had carried out when he’d occupied the White House. The American public bitterly resented Ford’s flagrant insult to their decency and his shameless disregard for their sense of honour. They had endured years of humiliation and disgrace while exerting their best efforts to eradicate the sleazy culture of corruption in which their leaders were immersed. Now, at a stroke, every honourable judicial process, every honest endeavour to set the house in order had been contemptuously dismissed by a hopelessly compromised, spineless rogue, no better than the crooks who had preceded him. Ford’s Republican party was annihilated shortly afterwards in the mid-term elections and at the very first available opportunity, he himself was replaced by a peanut farmer. But it mattered little to Ford. He had been appointed to the presidency to carry out one single task – to get his fellow crooks off the hook – and he accomplished that in jig time. 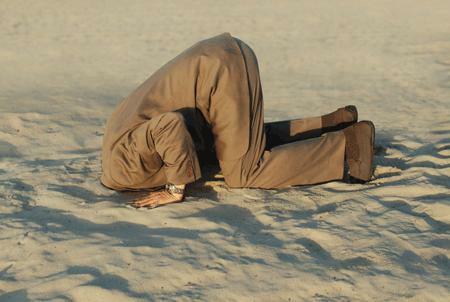 How the Daily Record broke the news of Rangers’ successful appeal to the SFA against Lord Nimmo Smith’s findings. I can’t imagine why this widely known example of secretive, Establishment mutual back-scratching and gross abuse of power and position to thwart the pursuit of justice suddenly sprang into my mind. I had actually intended to write about what might happen should the SFA have to hear an appeal if Lord Nimmo Smith finds that Rangers were guilty of fielding improperly registered players for a period of many years during David Murray’s time in charge of the now extinct club. I’ve quite forgotten what I was going to say now. A certain Rangers “blogger’s” recent appearance on Newsnight was unmemorable except for the statement that “Rangers have been punished enough”. Of course, Scottish football message boards exploded with laughter at this comment, and looking at opinion polls from around the SPL, the rest of Scottish society find it even more hysterical. Lets look at the facts. Firstly, “Old” Rangers were docked 10 points for entering administration. This is a consequence, not a punishment. Secondly, as of today, the transfer ban that was imposed on “Old” Rangers has been overruled by Lord Glennie. Owner Charles Green is still unsure how to proceed, with some saying he is trying to accept the transfer ban in order to avoid more stiffer and severe punishments. The League Cup semi-final against Danny Lennon’s spirited St. Mirren side ended with another Hampden let-down from a Celtic team which is getting to the stage where it can be relied upon to under-perform in do-or-die matches where victory is expected. Last season’s League Cup Final was a fairly evenly contested game for the most part but Kilmarnock got the breakthrough and deserved to edge it in the end. But there’s no doubting that Celtic didn’t do themselves justice. The Scottish Cup semi-final against Hearts was another occasion in which the Hoops looked as if they had forgotten how to do their jobs. Ross County’s stunning upset at the same stage of the same tournament was well deserved on their part but it was a mystery that Celtic played so badly when they were in the middle of a superb winning streak in the league and should have had great confidence in their ability to overcome their First Division opponents. This season, although Celtic eventually knocked Arbroath out of the Scottish Cup at the second time of asking, the performances in both matches belied the colossal gap in the status and resources of the two clubs. Many supporters would add to this list a severe disappointment in the Highlands a couple of years ago when Celtic seemed to be strong favourites to win the SPL until they lost an away match in Inverness. We should bear in mind, in fairness to the Highlanders, that they have consistently presented a difficult challenge to every club that visits them and it was Celtic’s turn to be ambushed that night but the result was still a shock. Personally though, I strongly maintain that the fix was in that season to ensure that Murray’s fraudulent enterprise got first dibs at the Champions League booty. The refereeing in that particular match was McCurryesque. That was a big factor in the ultimate result, not only in that match but also in the final league standings. But there is no denying that Celtic have regularly failed to show the hunger and will to win which the supporters are entitled to expect of the team. There can no longer be any doubt that this is true. I think it is highly significant that after the match Neil Lennon stated in an interview that some of the players were like spoilt children in the first half. That is a very strong – and not entirely inaccurate – criticism of the side’s thoroughly abject display but it is also very unusual for a manager to say such a thing in public. It makes me suspect that he has tired of regularly feeling duty bound to shield players from well deserved criticism in the wake of performances which are far short of what is rightly expected from them. However, I don’t think it addresses the core problem. More on that later. As far as the league is concerned, there has been criticism of the fact that Celtic haven’t won as many points this season as they had at the same stage of the last title campaign. I couldn’t care less how many points Celtic accrue so long as we end up with more than anyone else. Celtic fans are well aware of the nine-in-a-row which Jock Stein’s sides achieved. I doubt if there’s one fan in a hundred who could say how many points Celtic won in each of those years. What matters is winning the title. So I’m prepared to cut the team some slack in the league because, highly paid or otherwise, there is a limit to the amount of physical wear and tear which professional footballers can withstand over the course of a season. A successful quadruple campaign would require at least sixty-five games. The possibility of cup-tie replays and representative call-ups could easily take that total above seventy. It’s too much to expect any player to perform in every one of those games at the required standard so I’m glad that we have the opportunity to use squad rotation to rest players who need a break. The fact that several points may be dropped without fatally damaging the title quest is nothing but good news in my book. But in one-off, knock-out cup-ties, there’s a different set of criteria altogether and I don’t think the players have developed the correct mentality for these competitions. This is underlined to a certain degree by the fact that Celtic very rarely win a match in which they’ve lost the first goal. Games can be lost on the way to winning league championships but not in the course of a triumphant cup campaign. Recent Celtic teams have not shown that they have the ability to deal consistently with the pressure of playing in a match which they can’t afford to lose, most especially against opponents who set out to exploit that factor. There have been a few notable exceptions but Celtic’s best performances have generally come in games where they have felt that they have nothing to lose and lots to gain. The current Celtic side has a number of good qualities but it only overcomes its numerous deficiencies when every player’s work rate, self-belief and resolve are at a very high level. It’s the players’ responsibility to ensure that they rise to that standard every time they are called upon to discharge their professional responsibilities. If they’re not self-motivated, they’re wasting everybody’s time. The first-team coach can only encourage them and give them an opportunity to show that they are up to that challenge. If they don’t have the correct approach to their work, they need to look at themselves instead of hiding behind the management team. I expect that there are at least a dozen current Celtic players who are being honest with themselves tonight about why they froze this afternoon but they might not necessarily know how to find a solution. It appears to me that the fear of losing to underdogs strongly inhibits the present side. Too many players tighten up and, as their performance consequently suffers, so the prospect of defeat further erodes their self-confidence and they enter into a negative feedback loop. Losing the first goal highly exacerbates the problem. The downward spiral continues as players begin to panic or show petulant signs of frustration. These responses in their turn further reinforce the sense of impending doom and self-doubt. Opponents sense this and are inspired to raise their own game still further, buoyed by the growing belief that they have the psychological upper hand. Meanwhile, baffled coaches watch from the technical area, trying to understand why under-performing players are behaving like “spoilt children” or why they don’t seem to have the same hunger as their opponents. This is where I would have hoped and expected Jim McGuinness to earn his corn as part of Celtic’s coaching staff but I fear that his role is currently limited to working with youth players. I feel that Celtic would lose nothing by looking in the direction of professional advice from a successful sports psychologist to address some of the recurring issues that are afflicting the team. These regular pratfalls can no longer be dismissed as blips or off-days. They’re a direct result of well researched and fairly well understood mental processes and states of mind which need to be, and can be, adjusted with suitable programmes, specifically designed for each individual player. Football is still years behind other sports in this field but Celtic could do a lot worse than to make room for a Head Teacher in the first-team coaching staff.